UICC regularly reviews its capacity building programmes to ensure UICC programmes are not only contemporary but also targeted to meet the emerging needs of cancer control organisations and contribute to the development of cancer control at a country level. The programmes outlined on these pages are no longer offered through UICC to current applicants but demonstrate the breadth our our work across different topics, regions and education formats. Thirty-seven health professionals gathered at Tbilisi State Medical University (TSMU) this June to participate in an interactive nursing training in supportive care and healing for oncology nurses. Initially intended for 20 nurses, interest exceeded expectations as doctors, nurses, trainers and administrators alike signed on to learn new skills to improve patient quality of life and decrease anxiety. The training, led by Professor Frances Marcus Lewis, was a collaborative effort between Seattle Cancer Care Alliance, University of Washington (UW) School of Nursing and UW School of Medicine, Black Sea Partnership for Breast and Cervical Cancer Prevention and Control and TSMU. The training modules, initially developed by Professor Lewis for nurses in Russia and supported by a previous grant from Bristol-Myers Squibb, were revised and translated for the UICC-supported pilot in Georgia. TSMU launched Georgia’s first university-level nursing program in 2006 to improve nursing education and to raise the profile of the profession. However, despite increased capacity, Georgia faces an acute nursing shortage with the lowest ratio of nurses to total population among former Soviet states. The content of this training was designed to fill a gap in the existing curriculum and intended for integration into the nursing program. While all modules were well-received, the nurses were especially responsive to modules on Mindfulness and Meditation, Nurse Self-care and Imagery and Relaxation. Participants indicated that the training would positively impact their relationship with patients and their family members and were eager to implement the new skills in their work. The Vice Rector of TSMU stated that the training “created a different climate of care” in Georgia. Nine participants were identified as leaders/early implementers to be trained as nurse trainers. The project exceeded all expectations and all parties are actively engaged in planning the next steps to integrate the modules into the existing curriculum and support the development of nursing oncology in Georgia. Over the next 6 months the in-country partner (BSP) will conduct follow-up interviews with the participants to identify any additional barriers and the response to implementation of the skills in their work. We are grateful to UICC for its support of this project. In May 2014 a Francophone course for initiators of palliative care in sub Saharan Africa was held in Uganda and supported by the UICC workshop programme. This was a joint initiative by Hospice Africa (Soins Palliatifs) France (HAF), Hospice Africa Uganda and the Institute for Hospice and Palliative Care in Africa (IHPCA). The objective of the course was to equip health professionals who wish to start affordable and appropriate palliative care in their countries with the skills and confidence to do so. The five week course included two weeks of classroom training, two weeks of practical placements with palliative care units in Uganda, and a one week ’training the trainers’ course. The course is practice based and was run in Uganda, an English speaking country, because of the opportunity to observe and practise the Hospice Africa model. Participants are encouraged to share experiences from their own practise. The 20 participants were doctors, nurses, social workers and a pharmacist from 9 countries and the faculty was made up of former participants from francophone African countries and French speaking practitioners from France and the UK. The participants were required to find the cost of travelling to Uganda but many participants would not have been able to attend the workshop without the financial help received from UICC and HAF. All participants passed the end of course exam and 86% declared themselves very satisfied with all aspects of the course. Participants from several countries have started advocacy for palliative care in their countries and several have asked for follow up support from HAU. The African Cancer Registry Network (AFCRN) has been benefiting from the UICC Fellowships and Workshop schemes since it was inaugurated in 2012. The African Cancer Registry Network (AFCRN) was formally inaugurated on 1st March, 2012, and aims improve the effectiveness of cancer surveillance in sub Saharan Africa. 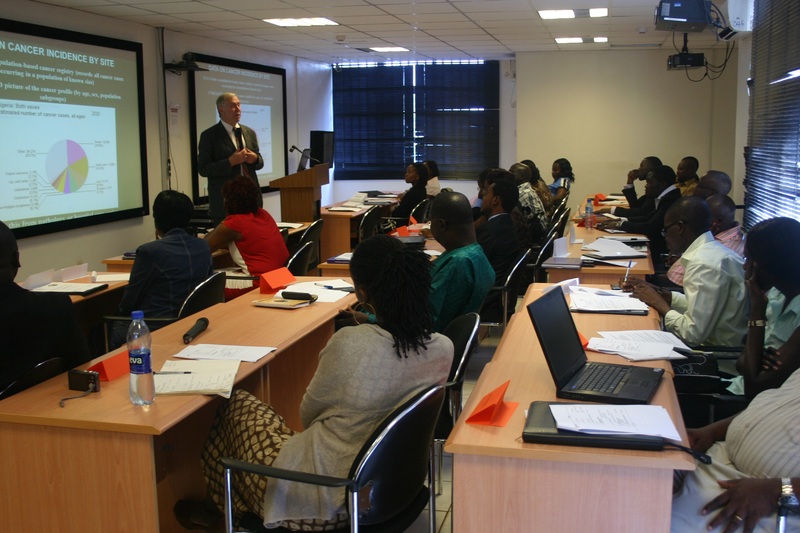 UICC has supported advanced training courses for more experienced cancer registry staff in Malawi and Nigeria in July and November 2012. 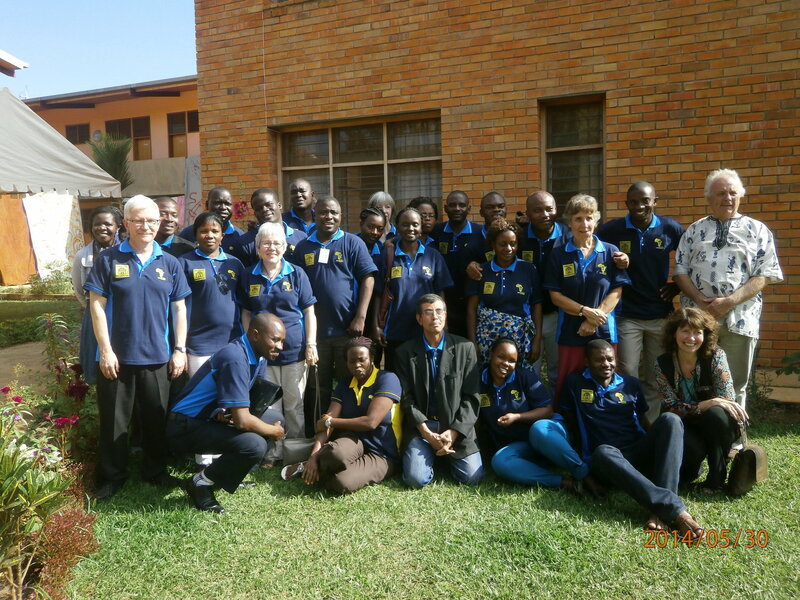 It also sponsored advocacy workshops as part of the Network’s Annual Review Meetings, in Kenya (February 2013) and in Zimbabwe (January 2014). Thanks to the UICC Fellowships and Workshop schemes, 36 experienced cancer registry staff from various African countries have had the chance to update their knowledge and skills on cancer registration, from principles of registration to day-to-day operational problems, from abstracting information from medical records to data management with CanReg5. This training has helped to improve the accuracy and the quality of data collected by member registries. In 2013, 21 member registries contributed an anonymous extract of their dataset to an AFCRN database, 19 of which were used to construct national estimates of cancer incidence, mortality and prevalence as part of Globocan 2012 (http://globocan.iarc.fr/). The advocacy workshops were welcomed by member registries. They provided a reminder, and information on techniques and skills on how to increase their visibility, leading to funding support, from national and international governments and health organisations. On a more immediate level, they served to remind registry workers of the range of available support, both financial and practical, from UICC itself. The Zimbabwe National Cancer Registry was able to gain support from its Ministry of Health and Child Care which led to the expansion of the Registry and a source of stable income. An advanced-level training course in Ethiopia has been scheduled for September 2014, and a sponsored fellowship is also planned for this year. The AFCRN is grateful to UICC for their contributions which have allowed the Network to grow and achieved its success today. Advanced training course in Abuja, Nigeria, November 2012. Dr. Parkin lecturing on cancer incidence. Workshop on palliative care in Ghana organised with support from AfrOx, ASCO, UICC, APCA/True Colours Trust, Ghana Health Service, in May 2012. In 2011 the Ghana Health Service and AfrOx, in collaboration with ASCO, APCA and Hospice Africa Uganda, (supported by Open Society Institute and National Cancer Institute, USA), ran a three day introductory workshop on palliative care for 111 health professionals from 9 out of the 10 regions of Ghana (including doctors, nurses, pharmacists and social workers). In 2012, the Ghana Health Service wanted to build on this programme by establishing model palliative care services in 6 hospitals (3 teaching hospitals and 3 regional hospitals), so that patients there would be able to get access to essential pain control medication and psychological support to reduce their suffering. The palliative care teams established will support all patients, not just cancer patients. The long-term goal of the programme is to establish a model that can be expanded across Ghana. To initiate this programme, a 5 day training workshop was organised in May 2012 in collaboration with AfrOx and ASCO to provide initial training for multi-disciplinary teams from these 6 hospitals (Korle Bu Teaching Hospital, Accra; Komfo Anokye Teaching Hospital, Kumasi; Tamale Teaching Hospital, Tamale; Kumasi Regional hospital, Kumasi; Central Regional Hospital, Cape Coast; Ridge Hospital, Accra). Improve access to effective palliative care including affordable pain relief for cancer patients and other patients requiring such care in Ghana. Support efforts to establish a national policy on palliative care for cancer patients. Increase access to integrated palliative care services nationally by training health professionals across the country and establishing multidisciplinary palliative care teams in 6 hospitals (3 teaching hospitals and 3 regional hospitals). Increase the number of trained doctors and nurses trained in palliative care. Reduce stigmas around the prescription of morphine amongst health professionals. Provision of training on advocacy. The direct beneficiaries of the programme were the 63 health professionals, including doctors, nurses, pharmacists, medical students, social workers, ngos and representatives of the Ghana Health Service, who were trained through this workshop. The training provided to the six teams from each hospital will be used as a template for the GHS to train other palliative care teams throughout their networks using trainers from the 6 teams that were trained. The long term aim is to establish a nationwide hospital-based palliative care service which will eventually lead to teams going into the community to provide services there as well. ICRETT Workshops are made possible thanks to our generous supporters.